The flare process data (flow rate, gas composition and gas condition) will dictate the size of the flare tip and level of radiation exhibited which in turn will affect the design, height, length of the flare support structure or boom. This data is normally determined following process simulation modelling of the process plant relief network under various operational, process trip, blowdown and emergency shut down scenarios. 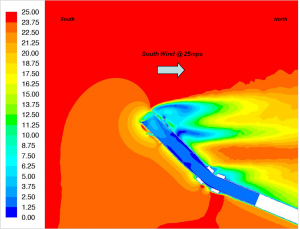 Dynamic simulation can be extremely useful to determine the maximum flow and duration of each flaring scenario and thereby avoid expensive over-sizing of the relief network, flare system and support structure. The maximum flow condition (typically emergency shutdown) will usually define the flare tip size, however it is also important to specify under what flow conditions the flare is expected to burn smokelessly and what utilities (if any) are available to achieve this. Even the lower flow conditions need consideration as they can have a dramatic impact on flare tip life expectancy. Low continuous flows in certain circumstances can also determine flare tip size. From the gas composition it is possible to evaluate the smoking tendency of the hydrocarbon gas and address any issues associated with the presence of other components such as hydrogen, hydrogen sulphide or inerts. A high hydrogen to carbon ratio will yield a clean burn whereas a low ratio will result in a highly luminous flame and considerable smoke generation. The radiation exhibited by the flame type will also vary considerably. The available gas pressure at the flare burner/tip is usually determined during the relief system simulation modelling. Greater pressure availability at the flare tip enables smaller flare risers and flare tips and provides greater energy for mixing the flared gas with the ambient air for a more efficient combustion and therefore reduced smoke generation.